"Read this book. You'll love it." Bill Henderson. Salvestrols - Nature's Defence Against Cancer. Bill Henderson is Editor and founder of the CANCER-FREE Newsletter and author of the book "Cancer-Free—Your Guide to Gentle, Non-Toxic Healing" (4th Edition). "In his book 'Salvestrols: Nature's Defence Against Cancer', Brian A. Schaefer documents a revolutionary new concept of how the body defends itself naturally from cancer. The findings are based on the combined research of Professor Gerry Potter, a medicinal chemist, and Professor Dan Burke, a pharmacologist, both from the UK." Carolyn Herriot. Fighting Cancer with Salvestrols. Carolyn Herriot grows "Seeds of Victory" at The Garden Path Centre in Victoria, BC. She is author of The Zero Mile Diet, a Year-Round Guide to Growing Organic Food and is currently writing The Zero-Mile Diet Cookbook (Harbour Publishing). "Salvestrols are a mixed fruit extract which has remarkable experimentally demonstrated anti-cancer properties, both in the context of prevention and treatment." Dr. William Ware. Salvestrol Update. Dr. William Ware is editor of International Health News and in the Faculty of Science (Emeritus), University of Western Ontario, London, Ontario, Canada. "The book lays it all out with scientific evidence to support the theories. What more evidence does one need to eat a healthy diet of organic herbs, fruits and vegetables?" Marilyn Zink. Preventing and Treating Cancer Naturally with Diet. Marilyn Zink has been publishing The Herbal Collective Magazine for more than 15 years. Marilyn has also written two ebooks, Herbal Theme Gardens and A Herbal Christmas. "This book is understandable by the masses and is a book about Salvestrol and the truly great people that are involved in the discovery of this life saving event, which is why I simply had to write about this book and Salvestrol." Sister Kaite Delaney. A Seriously Safe Cancer Medicine That Kills Cancer Not You. Sister Kaite Delaney holds a B.Sc. in physiology and a M.Sc. in Molecular Biology. She worked in the Molecular Epidemiology Unit of Virology Infectious Diseases for the state of Michigan. She writes on science and nutrition at NaturalHealthMagazineNewsletter.wordpress.com. "If you ever wanted proof that there was a link between diet and cancer, it can be found in a new book calles Salvestrols: Nature's Defence Against Cancer by Brian A. Schaefer." "With humour and meticulous research, author Brian Schaefer has written a real-life medical detective story about the remarkable discoveries made by respected scientists in England who are on the trail of a cancer cure." Julie Cheng. 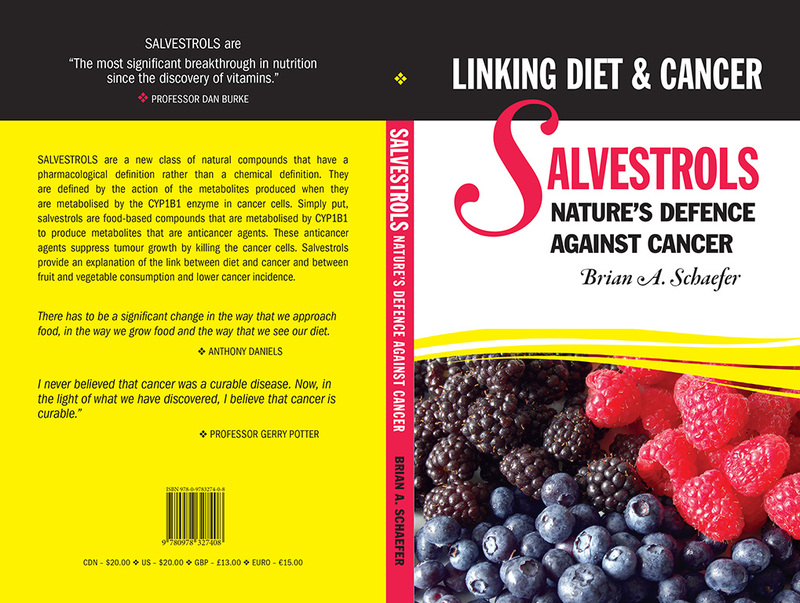 Book Review: Salvestrols--Nature's Defence against Cancer: Linking Diet & Cancer. Julie Cheng is a writer on issues related to natural health and a regular contributor to Health Action Magazine. John Appleton. Salvestrols Nature’s Defence Against Cancer. John Appleton runs a column in Channel titled The Healthy Channel. Scott Tips. Salvestrols Nature’s Defence Against Cancer. Scott Tips is a California-licensed attorney and President of the National Health Federation, the World's oldest health-freedom organization for consumers, as well as the Editor In Chief of its magazine, Health Freedom News. Copyright © 2012 Clinical Intelligence Corp. All rights reserved. No part of this publication may be reproduced, stored in a retrieval system, or transmitted in any form or by any means, electronic, mechanical, photocopying, recording, or otherwise, for any purpose, without the written prior permission of the copyright holder.